A KIND COMMENTATOR has suggested that I stand for Parliament. I thought it might be helpful to acquaint Bowalley Road's readers with the fact that I have already had a crack at that - back in 1990, when I stood for the NewLabour Party. 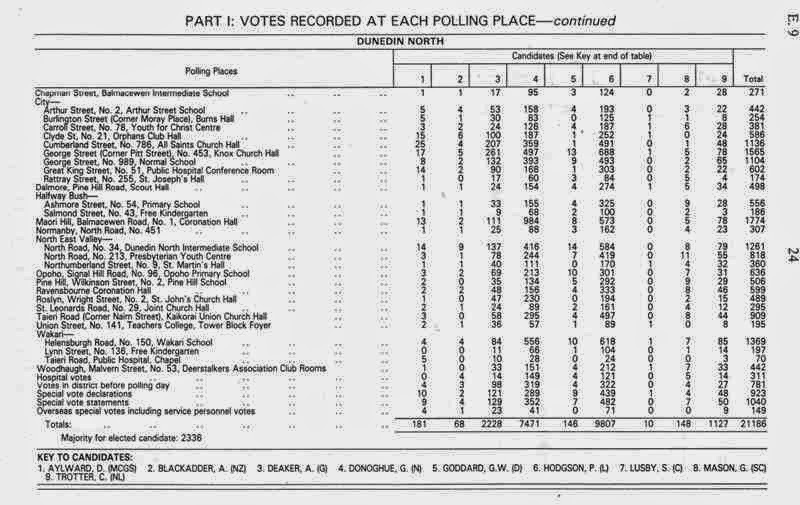 A glance at the E9 Election Return for the seat of Dunedin North will tell you that I didn't exactly take the electorate by storm! So, "Thanks", to my anonymous supporter, but - "No Thanks". As they say, I've "Been There - Done That". 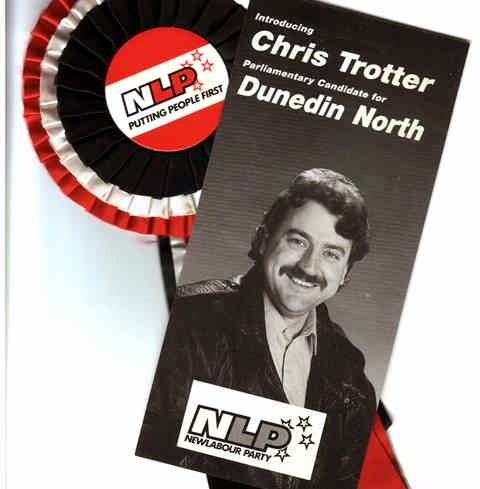 C TROTTER standing for NL received 1,127 votes (5.3%) of the 21,186 votes cast. Ha! Who is that handsome young chap? Those were the days, when we thought the neo-libs were a passing fancy and the neo-cons not yet a nightmare. Akshully ( Planet Key-speak), my post was occasioned by despair at the resurfacing of the dreadful Rebstock and her ilk coupled with a glass too far. I wouldn't seriously ask you to re-enter that snake-pit. Well not unless Winston decides to pick up where Jim left off! Insofar as there's anything such as an electoral certainty, North D will always vote Labour. Which makes me happy that I live in a community that shares my outlook. At least you got your deposit back and did what you could to hold them to account for the excesses of the Fourth Labour government. No you haven't ... you've tried to get in ...but you haven't been in the chamber long enough to smell the furniture and I think you have deliberately missed the point...people here think that you could actually be a positive force inside the house... your views are well documented.. you'd do well. When you (we) went to join up with Jim Anderton ,he seemed to be the only voice of reason in the political landscape of our country and the world; (except perhaps for Piggy Muldoon who everyone hated by then). The tide was coming in in a great rush for the neoliberalists, and you and he were trying to stand against it. When in 2007/8 the poo hit the fan in the great monetarist casino ,it should have all collapsed, but for now at least the day of reckoning has been postponed by massive fiscal and quantitative easing. This as you know has transferred a colossal debt from the players to the public sectors all over the western world. But the new right policies of the last 30 yrs have transferred real wealth , resources hydro etc etc massively from the public to the private 0.1%. And at the same time western govt's have handed over all means of controlling and managing their countries' affairs to the international casino market , so the public sector worldwide does not have the facilities or the resources to carry or service this debt.Ref Greece . In allowing the QE process . The relevant govt's and their bank managers have acknowledged in the most profound way possible that the neoliberal experiment has failed , though few of them will ever admit that that is what has happened. But the truth is gradually working it's way through to the masses, and with care and planing you next political adventure could have a very different outcome. Do you really think labour has thought out any alternative economics than they embarked on under Lange/ Douglas and managed on under Clarke /Cullan? Does Little have any ideas on the subject at all? If you think so this might be your vehicle . Chris, I think you should. You would do a lot better than a lot of the clowns in there. You have passion, and are half-pie articulate. Ahhh ... I knew it couldn't be the NLP's manifesto. Mind you, it has to be said you were comparatively popular in Balmacewen. The only booth where you topped 10% and one of only a handful where you beat your arch-rival, the dreaded Green candidate. I can't see Chris standing for the Greens even though I'm sure he supports a lot of his policies. Labour is his natural home if they move to the left a bit more.